1) You can try to close each application and then continually confirm that you do not need to save the data. 2) You can quickly press the reset key on your computer and then spend a great deal of time trying to restore working applications which were active before the reboot. 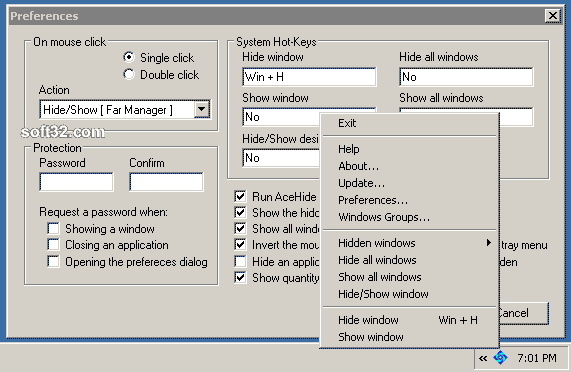 3) You can hide your window(s) by pressing a hotkey and, when your boss leaves, you can make the window(s) visible again by pressing the hotkey. If choice (3) is right for you, then you need AceHide.